Like most people I want to make sure my home is safe and free from toxins. But I also don’t like spending a lot of money and would have a hard time justifying having an inspector come out to my house other then when it was first purchased. 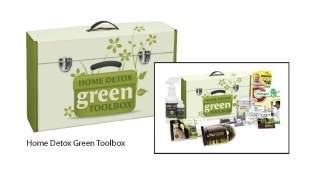 This green toolkit will help you learn about and test your home and other indoor environments for mold, dust mites (included in kit), pollen, dander, carcinogenic fibers and bacteria (optional add-on’s – see below). Additionally, a test for water including: Iron, Hardness, Copper, Nitrates, Chlorine, pH, Alkalinity, Bacteria and Lead. Then use the lead test kit to test paint or children’s toys. All of these tests can then be sent to a lab in the provided envelopes and you will have accurate information about your home and what you can do about it. - The Green Nest Non-toxic cleaner – The 4 ounce bottle of concentrate will make 2 gallons or 8 quarts of all purpose cleaner. - Lead Test Kits – (2) to test toys, cribs, paint, antiques and more for toxic lead. - The Water Test Kit – test for Iron, Hardness, Copper, Nitrates, Chlorine, pH, Alkalinity, Bacteria and Lead. - Indoor Air Quality Test Kit – tests for dust & mold in your indoor air. *Includes postage paid envelope and lab fees!